Welcome to the page for my first attempt at building a model railroad. I have been rail fan all my life growing up with a basement sized Lionel layout of my father's. I have always dreamed of building a model railroad and had from time to time picked up items at Peter MacDonald Hobby Supply in Kingston, Ontario, planning for the day I could finally start my layout. In the winter of 2005/2006 I made the leap into the world's greatest hobby. In the fall of 2005 in Truro, Nova Scotia, following a meeting of the Nova Scotia Railway Heritage Society , well known railway author and photographer, Bill Linley, introduced me to an experienced and talented model railroader, Robert Peck, who had recently moved to my area from Halifax. Robert and I live only 20km apart and have become great friends. He linked me up with the National Model Railroad Association and introduced me to other modellers in the area and before long I had begun to plan a railroad that would model Stellarton and New Glasgow Nova Scotia in 1978. In the summer of 2006 I was able to spend a day with Pictou Landing historian, Fergie MacKay. He was working on a great book about Pictou Landing and loaned some chapters of it's railway history. Some his pictures helped with the design of Pictou Landing. Fergie's book, A History of Pictou Landing, was released in December of 2014 and is now in it's second printing. I encourage anyone interested in Nova Scotia history and the industrial / rail history of Nova Scotia to get a copy of the book. I chose this era because I wanted to model VIA Rail as well as CN. I chose the location because Pictou County is one of my favourite parts of Canada and it is where my wife's grandmother had a family cottage. Many of my wife's ancestors hail from Pictou County. 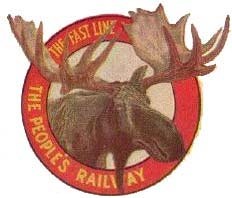 The name Intercolonial Railway comes from the original name of the Railway prior to it becoming part of Canadian National. Here is a short history of the ICR. I am now working on the second version of this layout as I moved in 2015 to a new city. I chose to completely dismantle the previous layout and start new. Some bench work and much of the track and turn-outs were saved for the new layout. It began construction in June of 2015. The original (and now dismantled) HO layout has developed in three phases. Phase one was 14' X 8' with an additional 7' X 3' section. This will be in the "train room" and will house Stellarton yard, New Glasgow, Trenton and Granton. Phase 2 went through the wall in two places into my office and will house the Pictou Landing Branch on one side and Abercrombie (Scott Paper) on the other side. Folks familiar with the location will know that the Pictou Landing branch has been gone since the 1950's, but because the family cottage is at Pictou Landing and there are some really interesting modelling possibilities, I will be departing from reality and keeping the line in. These two branch lines were built on 16" shelves with shelving below so that it can still function as an office. The Pictou Landing branch was about 18' and the Abercrombie branch about 6' . Until Phase 3 was in, staging yards in the main section represented Truro and Sydney / Antigonish. Phase 3 was an 18' extension in the train room which takes trains to North Sydney (Newfoundland Ferry) and Sydney (staging) as well as Truro (staging) with a few industries along the way. The original staging has become Havre Boucher which is a large yard that switches Port Hawkesbury, Port Tupper and area. I have received a huge amount of help and advice from a few fabulous friends. Robert Peck and Neil Lowes spent hours with me helping to prepare the train room and put up bench work. Robert has continued to be teach me the hobby and help with issues along the way. Other members of the club who have helped include, Tom Gray, Ian Hunter, Mike Jackman, Mike Koch, David Watson and Eric Halpin. I could not have possibly gotten this far without them! Thanks also to Steve Adamson for detailing and testing the design in XTrackCAD. The new layout was designed by Robert Peck in XTrackCAD. Warren Thwing, Grant Ledrew, Robert Peck, John Licharson, Bill Kelly, Ron Snipe, Michael Pasch, Dustin Pasch and Doug Burrell have helped work on the new layout. The bench work on the original layout went up on April 22, 2006 in just over 6 hours using steel studs, "C" channel and 200 framing screws. This was inspired by a Model Railroader article in May of 2005 and some recommendations from a friend of Robert's in Nova Scotia. It is rock solid and left behind no sawdust or glue stains, and a whole lot of time. It is held to the wall with a screw at every stud and four brackets. We built a gate but have decided to take it out as the layout will be more reliable with out. Here is a page of pictures of the bench work before the styrofoam went on. I have tried to keep the pictures fairly large so that others interested in building bench work this way can see what we did. The bench work on the second layout was started on June 18. 2015 using the same method with "grabber" screws. On the original layout, the Styrofoam was placed on top of the bench work. I purchased 9 sheets of 2 inch pink 2'X8' pieces of pink styrofoam insulation and one 1 and half inch 2'X8' sheet. It was glued to the steel and to other pieces with Lepage PL 300 and took 3 tubes to complete the job. Here is a picture of it. I discovered after this a much less toxic glue that I have used since called Loctite Power Grab - Foamboard. It is about $6.00 a tube at Home Hardware. The foam has been painted with a flat black latex paint. Please click the link above (left) entitled Layout Progress to see how it is progressing.